If you don’t have a toothache or other noticeable signs of an oral problem, you may be tempted to put off routine dental exams. You get busy, and it’s not on your top list of things to do since it may seem like you don’t have a problem. But neglecting these exams can have negative consequences for not only your oral health, but also your overall well-being. In this blog, the doctors at Dental365 explain why routine dental exams are so important. What does a routine dental exam include? Why are these exams important? Good dental care begins at home with the establishment of a good, consistent routine for brushing and flossing. Although this certainly helps keep your teeth and mouth healthy, it’s only part of an effective dental care regimen. When diligent at-home care is supplemented with routine dental exams, the combination will give you the best possible chance of maintaining a healthy and attractive mouth and smile. In addition, when you receive routine dental exams, your dentist can spot signs of trouble in their earliest stages. At this point, they can be more easily treated than if they develop into more serious and advanced issues. While these exams have a major role maintaining and improving your oral health, they can also do the same for your overall health. More than 90 percent of diseases that affect your entire body also affect your mouth, so often the first indication that you have a disease can sometimes be found in your mouth. 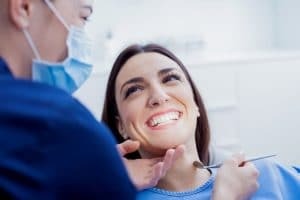 Where should you get a routine dental exam? Dental365 has numerous dental offices throughout the metropolitan New York area, and we’re home to top dentists as well as specialists. For your convenience, our offices are opened seven days a week. We provide exceptional care, offering every facet of dentistry under one roof. To receive a routine dental exam or to find out more about one of our other services, make an appointment or stop by one of Dental365’s offices in NYC or Long Island today.